More than 90% of the businesses in the United States are small. 60% of the U.S. population works in a small business. 80% of small business’ fail in the first 18 months. Employment and the US economy depend on small business success. One of the main causes for their failure is preventable. Their business failure can be traced to a lack of marketing knowledge. This is especially true in today’s environment, as the media landscape changes rapidly. Amplify Your Business empowers business owners with actionable insights to improve marketing results while saving time and money. 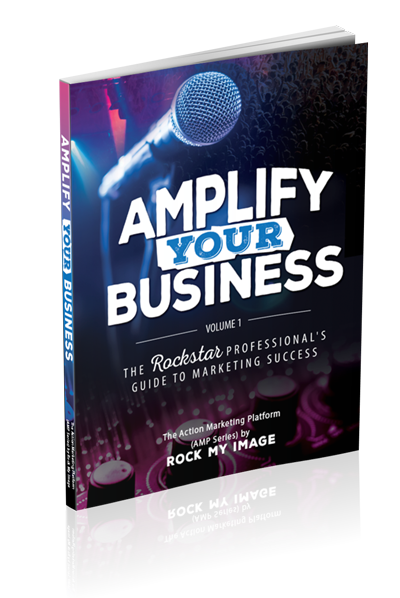 Amplify Your Business: The Rockstar Professional’s Guide to Marketing Success is Volume 1 of a 3-part series planned that moves the business professional through 11 levels of marketing success. Like the volume dial on your radio, you may start at level 2 or 3, but with the right actions, over time you can move up to levels 7, 8, 9 and even beyond. The goal is to provide realistic actionable advice so that progress can be made through time. Rock My Image is an Attraction Marketing Agency helping professionals create an image of influence through thought leadership to realize their bold visions of success. Combined, the authors have more than 50+ years of experience as successful business owners and marketing professionals and have worked with thousands of business owners as agency owners, speakers and industry leaders. Rock My Image has peeled back the "layers of the onion" and gone deeper inside the vision, mission statement process and WOW!!! There will be amazing results!! This will be a must read for anyone who wants to be at the top of their field. Amplify Your Business provides just the right amount of information written from a realistic point of view. There is no fluff, no grandiose theories and we don’t lose you in the minutia. You will receive actionable insights based on real experience and our proven approach.